"What would you do if..."
If you're anything like me, you tend to think ahead, running scenarios in your mind about how you would handle any given situation, good or bad. I do this when I'm waiting at the doctor's office, driving along a long stretch of highway or during any other relatively mindless activity. It's entertainment for me as well as a means of preparing for "the unthinkable" as recommended in the personal protection and self-defense training I've taken. I've learned through self-defense training that the more you imagine yourself working through various scenarios in your mind, the better prepared you will be should they happen in real life. Your brain tends to "click" into gear, and your reaction time is faster, allowing valuable seconds to act and escape danger when it's had the opportunity to "rehearse". 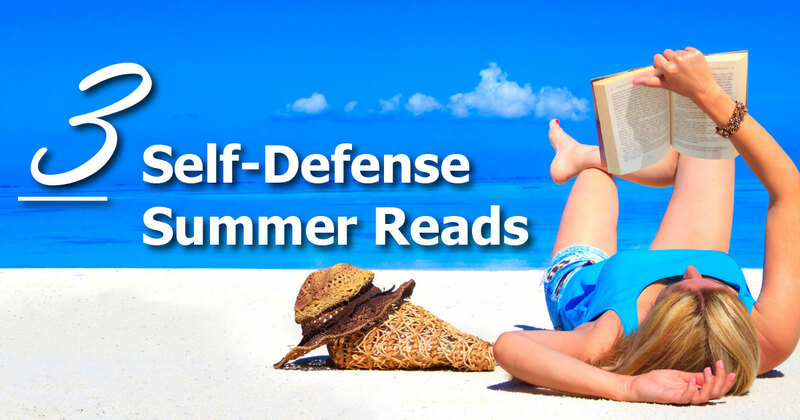 The following books are highly recommended by Personal Safety & Self Defense instructor Preston L. Taylor. Preston Taylor (aka “PT”) is a police officer with over 20+ years of experience and a vast knowledge of personal protection and self-defense. Within his course, he mentions the benefits of reading three books. Add them to your list of must-reads, to prepare for the unthinkable. I'd say it's a "win-win" situation, you can never be too prepared. A date won't take "no" for an answer. The new nanny gives a mother an uneasy feeling. A stranger in a deserted parking lot offers unsolicited help. The threat of violence surrounds us every day. But we can protect ourselves, by learning to trust—and act on—our gut instincts. Which is the safest seat on an airplane? Where is the best place to have a heart attack? Why does religious observance add years to your life? How can birthdays be hazardous to your health? Each second of the day, someone in America faces a crisis, whether it's a car accident, violent crime, serious illness, or financial trouble. Given the inevitability of adversity, we all wonder: Who beats the odds and who surrenders? Why do some people bound back and others give up? How can I become the kind of person who survives and thrives? The fascinating, hopeful answers to these questions are found in THE SURVIVORS CLUB. In the tradition of Freakonomics and The Tipping Point, this book reveals the hidden side of survival by combining astonishing true stories, gripping scientific research, and the author's adventures inside the U.S. military's elite survival schools and the government's airplane crash evacuation course. With THE SURVIVORS CLUB, you can also discover your own Survivor IQ through a powerful Internet-based test called the Survivor Profiler. Developed exclusively for this book, the test analyzes your personality and generates a customized report on your top survivor strengths. Today, nine out of ten Americans live in places at significant risk of earthquakes, hurricanes, tornadoes, terrorism, or other disasters. Tomorrow, some of us will have to make split-second choices to save ourselves and our families. How will we react? What will it feel like? Will we be heroes or victims? In her quest to answer these questions, award-winning journalist Amanda Ripley traces human responses to some of recent history’s epic disasters, from the explosion of the Mont Blanc munitions ship in 1917–one of the biggest explosions before the invention of the atomic bomb–to the journeys of the 15,000 people who found their way out of the World Trade Center on September 11, 2001. To understand the science behind the stories, Ripley turns to leading brain scientists, trauma psychologists, and other disaster experts. She even has her own brain examined by military researchers and experiences, through realistic simulations, what it might be like to survive a plane crash into the ocean or to escape a raging fire. Want to Learn Self-Dense from the Comfort of Home? This online HD Video Course enables you to learn self-defense at your own pace. This entry was posted in Personal Protection, Real Estate and tagged Hotel Personal Safety, personal protection, Personal Safety, Personal Safety and Self Defense, Real Estate Self Defense, Self Defense.